The Whistler CR85 is the company's range-topping non-GPS model. The front of its case is dominated by a blue OLED text display that’s larger and higher-contrast than many such designs. Voice alerts and tones are provided, helping the driver to identify the nature of an alert. Visual alerts are displayed on the OLED screen, augmented by two dazzling blue LEDs that flash during radar and laser attacks. The Whistler CR85 is designed for plug-and-play use but has an array of settings for fine-tuning its operation. There are also several features intended to reduce annoying false alarms without ruining performance in the process. Three City modes progressively lower X-band sensitivity or disable it. There are six filter modes for the trio of radar bands, allowing a separate level of filtering for each. TFSR (Traffic Flow Signal Rejection) rejects signals from the low-powered, pole-mounted radars used by transportation departments to monitor traffic flow and speeds. We tested TFSR in metro Denver and verified that it works as advertised. 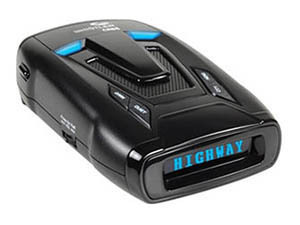 A unique feature is Ka RSID (Ka-band Radar Signal Identification) which verifies when a Ka-band radar signal is coming from a police radar gun. Other alerts can safely be ignored. At our Curve/Hill test site the Whistler CR85 stayed close to the class-leading Beltronics Pro 100 and ahead of its Cobra competition. The Whistler CR85 stands out for its sophisticated design and effectiveness in countering radar and laser guns.